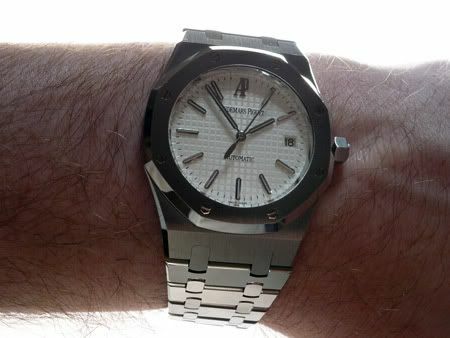 AP Royal Oak: 15300 more interesting than the 15202 (a.k.a Jumbo)? Friends of mine have the 15202 and are quite clear on the 15300. A no-brainer, because of the second hand with the ‘wing’ on the short tip, the movement and the thickness of this watch. The movement used in the 15202 is indeed a beauty. However, I think that focusing on movement only is not something you should be doing. It should be the whole package of design, usability/wearability, price etc. that needs to be right. Besides a different movement (AP caliber 2121 vs 3120), the 15300 is a bit more masculine than the 15202 Jumbo. One of the first things that got my attention was the look & feel of the entire watch. The stainless steel watch case (39mm) and bracelet with satin finish is heavier than the 15202. Not only in weight, but also in the construction of the case and bracelet. The bracelet of the 15300 feels solid and the size is just right, as opposed to the bracelet on the 15202 Jumbo, which feels a bit fragile. I am probably stepping on toes of purists here, and I am a bit amazed myself as well, that this watch gives me this impression. Given the price of the 15300 – market price approx.6500 euro versus approx 8500 euro for a 15202 – I don’t know if I would care enough for the caliber 2121 of the 15202 to pay almost 2000 euro premium for it. I think I prefer a case and bracelet that are more convenient and wearable than having the cult version (15202) with a movement that is more sought after. The dial of this white fellow is pretty neat as well with its famous pattern of the AP RO and applied logo. The hands and hour markers are made out of 18kt gold. 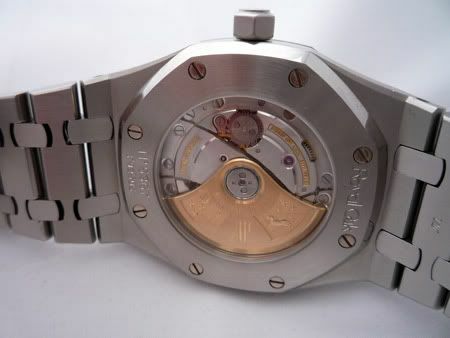 The only downside of the dial is the lettering of Audemars Piguet and Automatic. 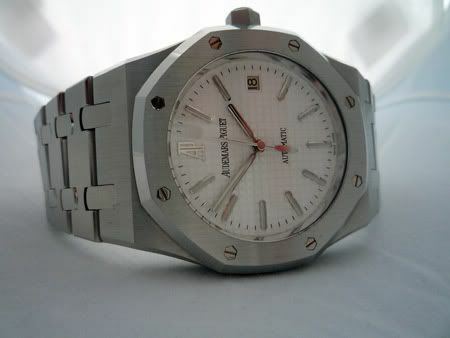 The font is a bit too bold, and they could have left ‘Audemars Piguet’ off the dial completely, as the applied logo makes it clear that you have an AP anyway. However, this wouldn’t be a dealbreaker for me personally. When handling an AP Royal Oak, I am always impressed by the finish of the case and dial. The satin structure of the stainless steel (or gold) is true craftmanship and way more impressive than let’s say, my IWC Ingenieur 3227-01. 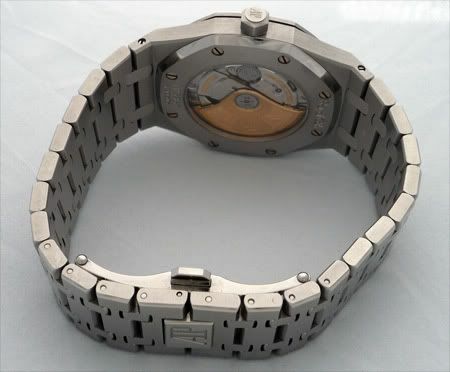 When you touch the bracelet of the AP Royal Oak, you can actually feel the satin brushed lines on there. When you do the same with an Ingenieur for example, you just feel a smooth surface. The caliber 3120 movement in this watch is a real beauty. The 22k gold rotor with impressive engravings covers the 4.25mm flat movement (which is very flat) inside the 15300. The sapphire displayback gives an excellent view on this small masterpiece. I don’t know if it’s because this transparant caseback, but the watch is only guaranteed water resistant for 50 meters (5 bar). This isn’t very much for a watch that is considered to be ‘sporty’. Taking the price of this particular watch (it’s for sale at Watch-Site) into consideration, 5750 Euro, dated 12-2007 complete with box and papers, it is a very interesting stainless steel sportswatch, that still breathes the ‘cult’ of Genta’s original design of the 1970s. Given the price and the updated design, the Audemars Piguet Royal Oak ref.15300ST could be more interesting to buy than the iconic Royal Oak ‘Jumbo’ ref.15202ST. Update: New insights! The story is being continued here!